I barely made it out of Cardiff. I had set an alarm to catch my bus at 8:00 a.m. at the central bus station. As I walked between campus buildings, taking a short cut I had discovered the night before, I thought it would be a good idea to double check the departure time on the ticket. “Seven forty-five,” it admonished in the stern tone of a British bureaucrat who really thinks you should keep a better calendar. I balled up the ticket and stuffed it into my pocket as I ran towards city center. But after a block of sprinting, I stopped. My bus was parked just across the street from where I stood, just on the outskirts of the Cardiff University campus. I uncrumpled the ticket in my pocket and discovered that not only had I made a mistake on the departure time, but also the bus stop location. I did, however, take photographs of places I hadn’t been before and imagine aren’t photographed thousands of times daily. 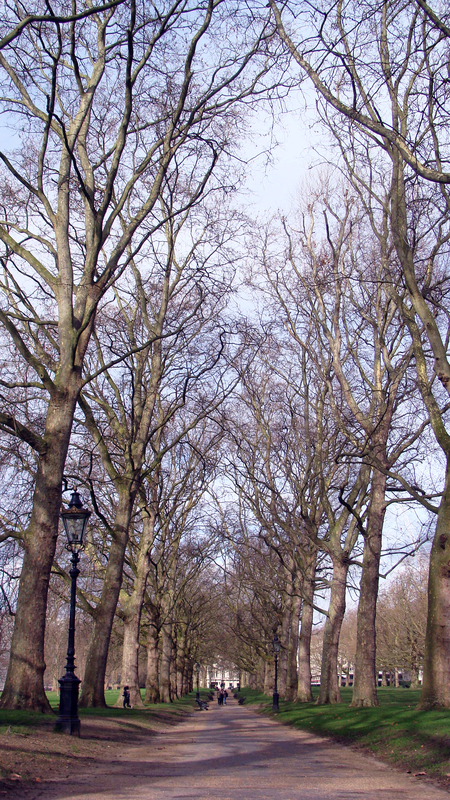 Enjoy Green Park. I arrived in London and made a beeline from Victoria to Mayfair by way of Buckingham Palace. Now would be a good time to mention that while I planned my walking routes for the day such that I would see the Palace, Westminster Abbey, Parliament, the Eye, etc. I didn’t take any photographs of them. The reasons are 1) there are many photographs of them on the internet that are much better than the ones I would’ve taken and B) I took photographs of them 6 years ago and to no one’s surprise the centuries old buildings have not changed since then. So long as I’m making excuses for myself, I’d also like to apologize to Joy and Rebecca (presuming you’re reading this) who I promise to visit upon a future outing. Since I was only going to be around for a few hours I thought it was best to get together another time. I was headed to Mayfair to fill up my belly after being left destitute by Zerodegrees the night prior. The Market Tavern was my target, and after navigating through the alleys and narrow side streets that seem to permeate London, I found it. I took no photos this time, because frankly the roast was not as spectacular for the eyes or the mouth. It was still quite good, but not the revelation that eating at the Clarendon Arms had been (and has been again, having returned for dinner since). I did however enjoy a particularly delicious porter (maybe?) called Dark Dunter out of Scotland. It had terrific dark malt aroma and flavor with clear toffee and chocolate notes tempered by a dry roast finish. I attempted to follow it up with a brew from Brains Brewery based on an ancient Welsh beer called bragawd, more familiar to us today as braggot, a cross between a mead and an ale. 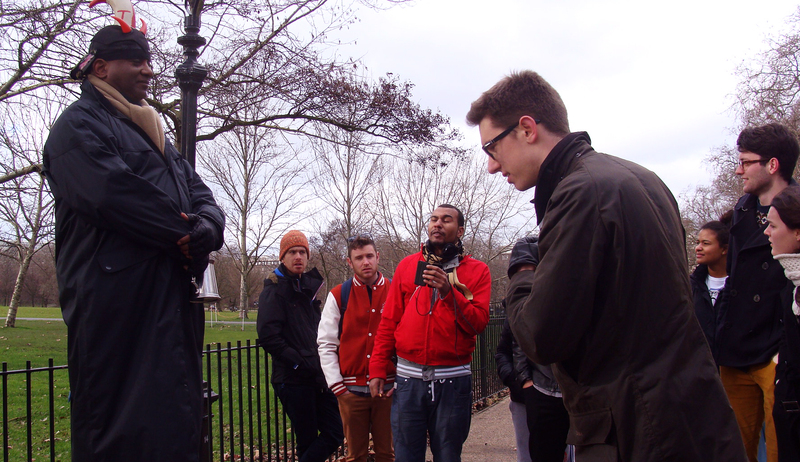 Unfortunately the cask was kicked, so I headed off to my next destination: Speakers’ Corner. The man on the left was pontificating on modern systems of oppression spawned by colonialism. Also he was wearing that hat. 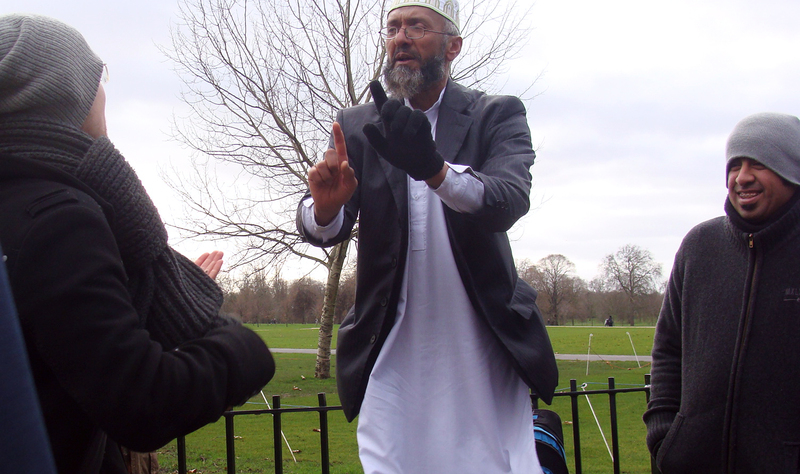 Speakers’ Corner is a point of congregation in Hyde Park for debating and speech-making on any topic of concern to the public, in use for demonstrations and protests since the late 1800s. During the two and a half hours I spent there, perhaps forty or fifty people braved biting winds and hail to participate. At first I was a bit reticent to participate, and just listened as a senior at Imperial College (kid in the foreground on the right in the picture) weakly attempted to deny the influence of colonialism on contemporary social and economic structure in nations around the world. But gradually his dismissal of valid points and proclamations of British supremacy grated on me, and I began taking jabs at him, asking him direct questions that clearly undermined the legitimacy of his arguments. It wasn’t long before I found myself debating the validity of the theory of evolution and listening in on an argument over the legitimacy of the royal family of Saudi Arabia. These two men disagreed on the correct interpretation of the holy trinity. Later the man with the scarf tried to convince me that the woodpecker is an example of an organism that cannot be explained by the theory of evolution. The experience made quite an impression on me, and has (perhaps wrongly) been incorporated into my view of British culture. Even though the tradition may have only been kept alive by 40 or 50 people in a city of over 8 million on that dreary day, there are enthusiasts who keep audio and video recordings of speakers and many of the participants seemed to recognize each other. I would happily return myself and be glad to see speakers who I disagreed with. Debate was often fierce and impassioned, but civil. Jokes would be intertwined with arguments, and friendly pats on the shoulder would often be exchanged between opposing voices. Nonetheless, as the weather intensified and my shivering became more violent, I decided to seek shelter. 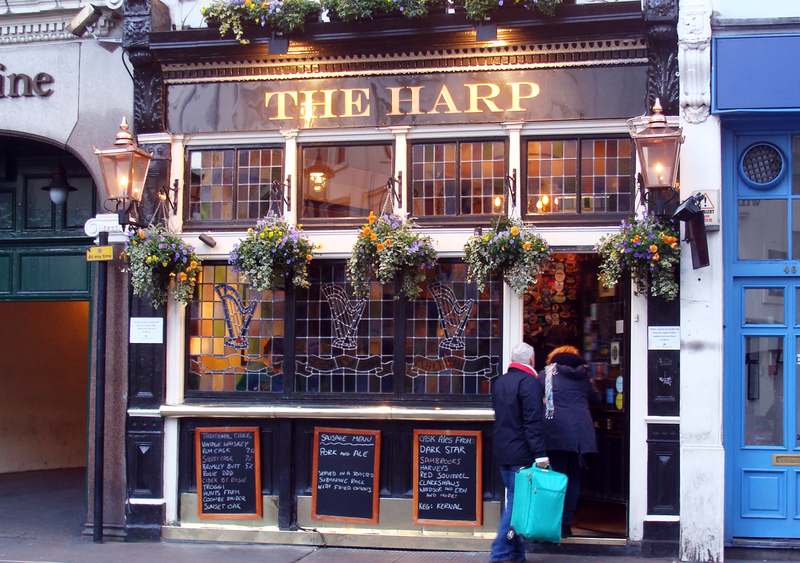 No one will be surprised that I sought shelter in the UK’s best pub, The Harp. With a choice between 10 cask ales, I foolishly ordered a pint of my first selection, Dark Star Brewing’s Hophead. It was much like many other bitters I’ve had on cask here, except with slightly more citrus hop flavor than floral. Since I had already had a full pint, I just finished up with a half-pint of porter, the name of which I unfortunately cannot recall, but at that point I was more focused on soaking up the aesthetic of the pub than soaking up beer. 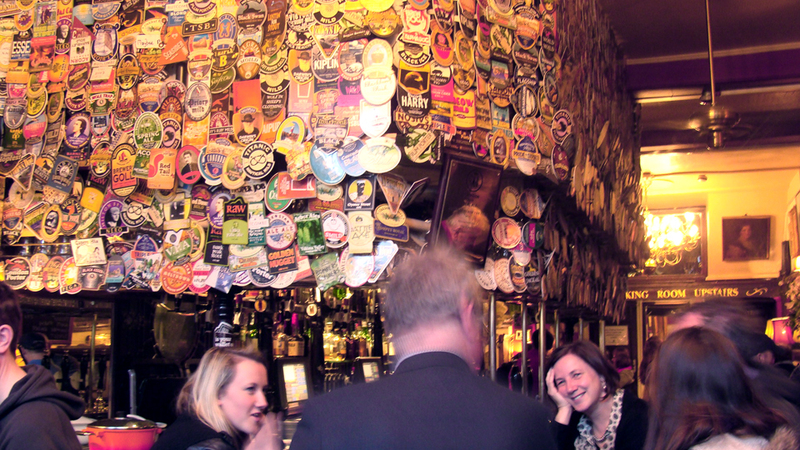 Portraits hung on nearly every available patch of wall and the bar was covered in pump clips. I sat next to a photograph that had one first prize in The Harp’s photography contest, which was a picture of exactly where I was sitting. The picture resembled a Rockwell illustration in style, displaying a newspaper resting under a full pint next to the lamp and portrait which were directly in front of me. One could easily imagine themselves back decades or a century with the quiet conversations between friends and the warm decor. Having finished my porter, I decided to call it a day and walked back to the bus station, taking a scenic route along the Thames. Despite the fact that I tend to eschew dogmatic reverence to historical sites, I couldn’t help but think about this political cartoon of Michael Faraday, who was consulting on the state of the river during his day, and feel a bit special being just where I was. More travel is imminent. Tomorrow I board a plane bound for Berlin in order to reenter the UK so I can fix some issues with my visa stamp at border control. I have a handful of adventures planned for my two day visit there, and will update soon. This entry was posted in beer, travel and tagged bragawd, London, narrative, porter, Speakers' Corner, Sunday roast, The Harp on February 10, 2014 by Dylan Bargteil. Travel safe and have fun in Berlin!!! !